Chances are extremely high that the majority of San Francisco home cooks aren’t baking their own pie because, from blueberry with a lattice crust to mincemeat with a brown sugar crumble, pies aren’t just a trivial “add a few ingredients, mix, throw in oven, and forget it while you answer emails” type of recipe if you’re going at it fully from scratch. Sure, the Pillsbury dough boy can help cut a few pie corners when you desperately want to put a pie on the table promptly, but, when crust is 50 to 60% of the whole pie equation, the likelihood of a transcendent pie in that case will have already been cut dramatically. There’s no way around it—pies need tender loving care. San Francisco’s unofficial newly crowned master of the pie-baking art, Angela Pinkerton, offers up some critical advice to aspiring pie bakers that her “secret” to outstanding pie results isn’t really a deep piece of wisdom but something we need to be reminded: relax. Don’t overwork the dough. Don’t over-season the filling. Pinkerton’s baking office these days is at four-week old Theorita, a contemporary take on a mid 20th century Midwest dinette (think an intimate diner with a condensed menu) on the ground floor of a renovated autobody shop, below its neighbor and Divisadero’s scorching hot Cali-Italian cooking destination, Che Fico. 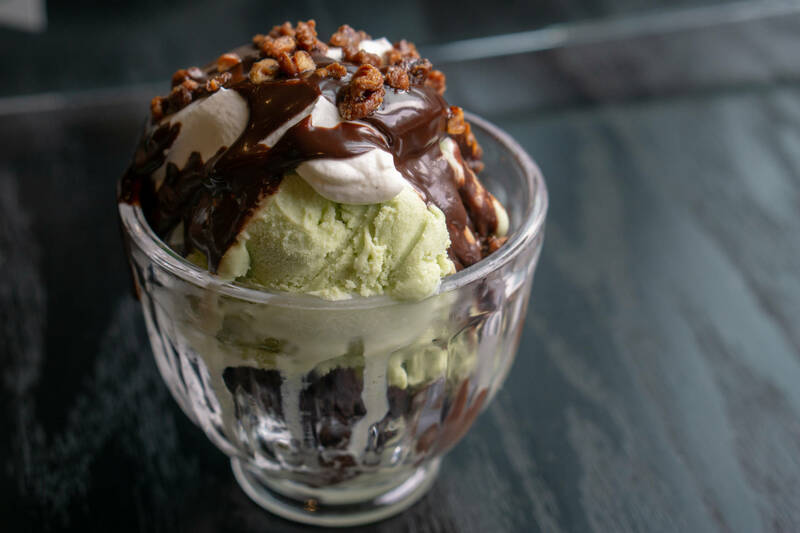 Her name might ring a bell from a somewhat recent article on this website when this writer chronicled the opening days of Che Fico, where Pinkerton is responsible for the fantastic rustic desserts. To this day, Che Fico remains the most in-demand table of the moment, neck-and-neck with State Bird Provisions with who can have a longer sidewalk line at 6 PM on a given night. Anderson Cooper and Gwyneth Paltrow both dined at Che Fico and gave it the Instagram love. 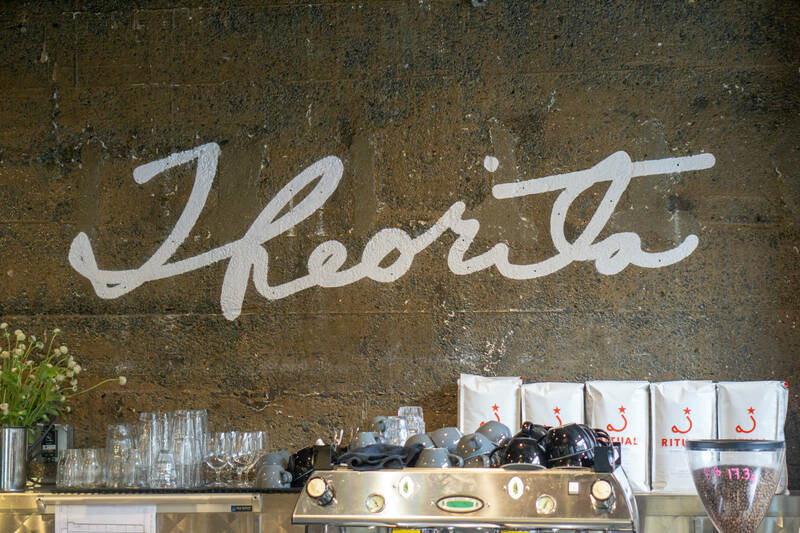 Che Fico is an anchor for dining on the Divisadero corridor, the hottest restaurant zone in the city. The area is at the heart of the gentrification debate, arguably the hottest topic these days in San Francisco. It’s where $4 toast was invented. Google buses clog Divisadero’s narrow four lanes at morning and evening rush hour times. Real estate prices in the area are skyrocketing. There is just so much…EVERYTHING…right now in that particular neighborhood at this particular time. The sudden growth and controversies and the debates surrounding could all use a slice of humble pie. And, on cue, here is Theorita, full of a case of Pinkerton’s unfussy, spectacular pies. There, tucked inside by the sidewalk adjacent window, is a classic apple pie on display, perhaps next to the somewhat unexpected corn custard pie and the very unexpected passion fruit with bay leaf cream pie (slices are $5.50 and whole pies are $34). 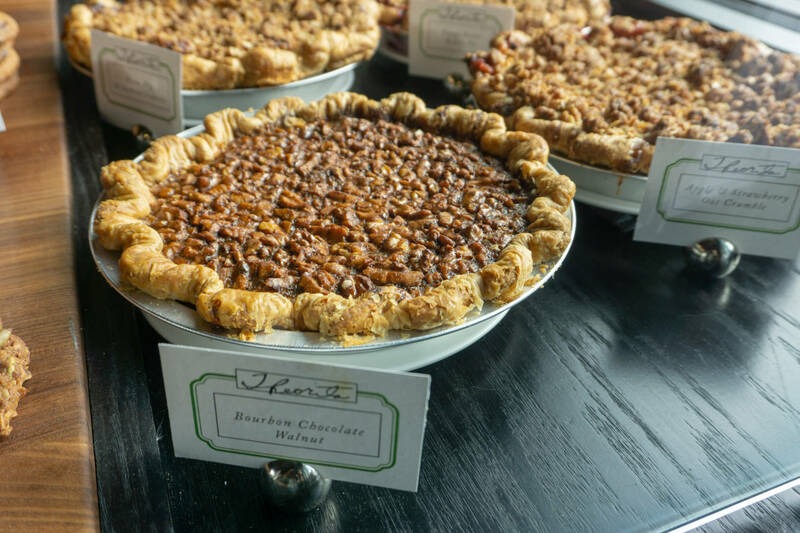 You’ll always find bourbon-chocolate-walnut pie because, Pinkerton joked to us, “San Francisco can’t get enough bourbon,” but it probably has a lot to do with the term “chocolate” in the filling. There might be a summer berry pie, or a peach and oatmeal crumble pie, or a raspberry and white nectarine pie, or a smaller “sweetie pie” topped with practically a whole pound of strawberries or raspberries (usually $10), or who knows what else is in season that Pinkerton is inspired by. 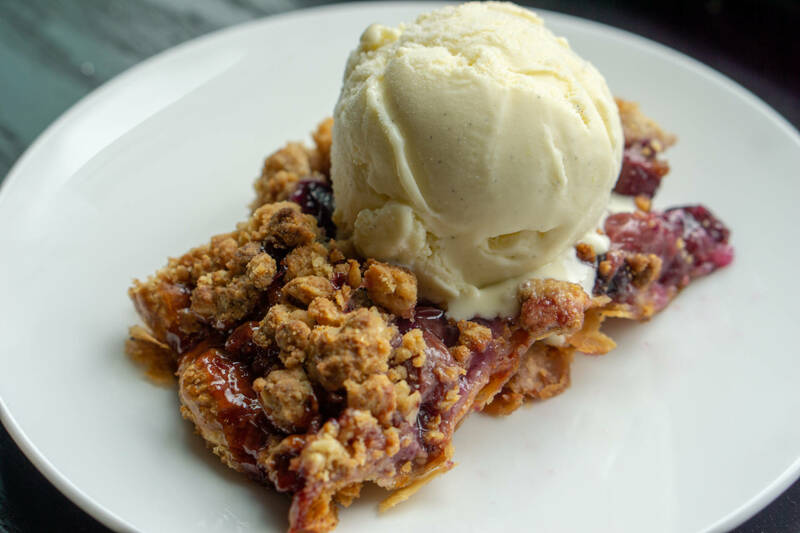 Even that childhood sandwich favorite, PB & J, gets translated into a pie form with a crust similar to a peanut butter-oatmeal cookie and a “jelly” filling made of seedless Thomcords that are really only in season for the tail end of summer like tomatoes. 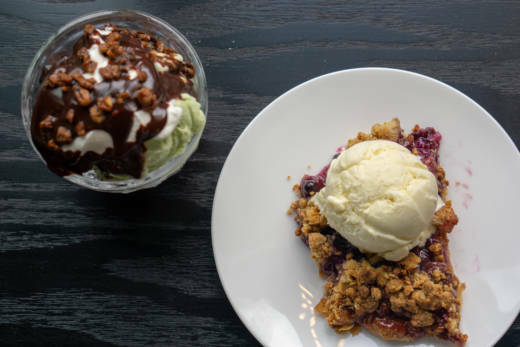 Pinkerton is constantly tinkering with new pie crusts, fillings and toppings. There might be some chocolate in one crust or rosemary to join fresh raspberries. She’s having every bit as much fun within the genre of “pie” as the chefs upstairs are having with pasta. It’s really exciting to watch. It’s not just pies, however, to tempt your sweet tooth. The salted pecan sticky bun is what generally jumps out to prospective diners first at the green-hued pastry case. It often resides next to a puffy brioche-based chocolate orange sugar bun. Then there are Danishes often filled with a sweet cheese of some sort and sometimes with berries or fruit. Pies might be the specialty of the house but Pinkerton wants Danishes to be considered the vital supporting character in the bakery cast. There are no croissants to be found, but those Danishes and savory roasted scallion “swirls” are part of the laminated dough family. 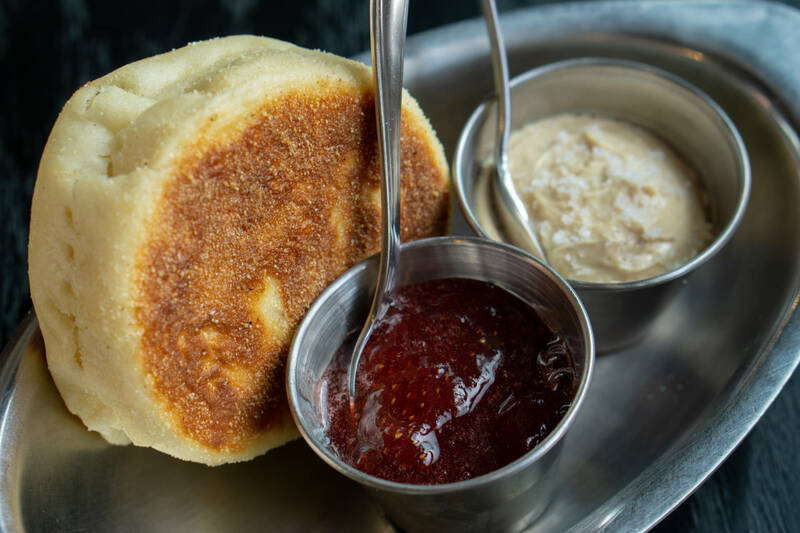 You’ll also encounter “quick breads” and more breakfast-friendly baked items like a chamomile ginger scone and or a chocolate zucchini muffin. But, wait, then there are the cookies that range widely in size, shape and texture from seeds n’ berries oatmeal to sweet potato and coffee (most cookies are $3 and pastries are usually $4-$5). On the competitive San Francisco chocolate chip cookie scene, Pinkerton is very much trying to balance a crunchy exterior with a soft, tender interior and a good dose of butter for richness without being too distracting from the Vahlrona chocolate chunks. She aspires for the “best of both worlds” and the city’s cookie monsters appreciate that. 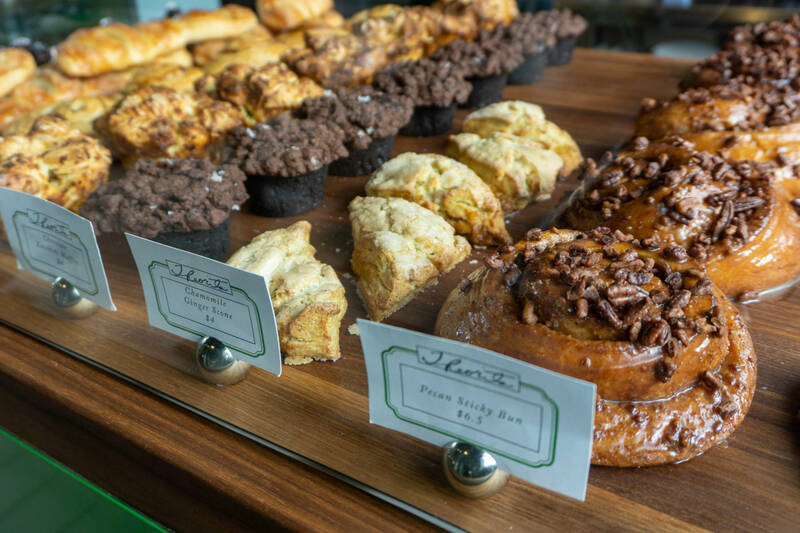 San Francisco’s diverse and abundant baking scene is one of the giant reasons that attracted Pinkerton to relocate to the Bay Area in the first place. And, her repertoire offered at Theorita very much follows in the same tradition of our local legends like Tartine, b. Patisserie and Craftsman & Wolves—baked goods that are comforting and approachable, slightly rooted in a classic American or French nature, then often given a clever tweak or seasonal produce boost. San Francisco baking doesn’t follow the rigid structure of, say, a Parisian patisserie or a Viennese bakery. We’re all about butter, sugar, produce and delicious fun. Theorita is now the latest stop on our city’s phenomenal tour de pastry cases. Pinkerton’s personal journey didn’t involve staging at a legendary bakery or a canelé epiphany in the French countryside. It started in a very different countryside — what her website describes as the “rolling hills” of northeastern Ohio, though this writer lived for a year about an hour away and can attest that the “hills” are mild enough that he had to run in and out of sand bunkers on a golf course to get a hill workout. Simply put, it’s very pastoral farmland in northeast Ohio. Her hometown of Alliance, Ohio, is the vintage slice of wholesome Americana that is rapidly disappearing from this country. It resides near the Akron-Canton part of the Buckeye state, just south of Cleveland, and best known to outsiders for being the home region of Lebron James, the Pro Football Hall of Fame, and Goodyear Tire and Rubber Company. Then there is a fourth thing that locals correctly boast about the area: the apple orchards. Her maternal grandparents had an orchard, so its apple crop was always a part of Pinkerton’s childhood. Meanwhile, her parents always had a garden and young Pinkerton would help out with cooking at home. Becoming a chef was never something that she thought about while growing up, but there is no doubt that food, especially pie, was instrumental in her youth. Her grandmother, Theorita (the restaurant’s namesake), had spent decades perfecting various kinds of pies as the mother of five children and because her husband always wanted dessert. Pie was a somewhat fast, somewhat easy, and very delicious way to please the growing kids and hungry husband. Pinkerton later pursued a biology degree at Kent State and took a job working as a clerk at a bakery, which evolved into a full-time gig baking wedding cakes while also being a student. She left Kent State to open her own wedding cakes concept, “Let Them Eat Cake,” and then opted to learn more about savory cooking with a kitchen job at a local country club. After being largely self-taught, Pinkerton figured that a proper culinary education would greatly help her career prospects. So, she left Ohio for the swamp of our nation’s capital and studied pastry arts the now-closed L’Academie de Cuisine just outside D.C. Her next stop after graduation was as a pastry chef for the Ritz-Carlton, Pentagon City, where she doesn’t have too many juicy politician stories to tell, but says there was “always drama, always something” going on. It was definitely a world away from Alliance, Ohio. As grand a stage as Arlington, Virginia is, Pinkerton was ready for the grander stage of a restaurant in the grandest restaurant market of the country. Pinkerton’s first “restaurant job” happened to be at Eleven Madison Park in New York, which at the time in 2007, was not one of the “World’s 50 Best Restaurants.” It was merely an excellent restaurant in a gorgeous setting, owned by New York’s most successful restaurateur (Danny Meyer) and an innovative, immensely talented ex-San Francisco chef (Campton Place) named Daniel Humm. Eleven Madison Park wasn’t Eleven Madison Park back then. But, it was still a huge deal with the same name and a different type of ambition than it has now. For a first restaurant job to be there, well, it’s a huge accomplishment with not your average job debut pressure. Pinkerton clearly was ready and even chuckles when every writer, including this one, asks about how her first restaurant job was at the “pinnacle of her profession.” For Pinkerton, it was just her first restaurant job. It was work. 2009 was the breakthrough transition year for Eleven Madison Park and Pinkerton. Frank Bruni, then the New York Times Dining Critic, awarded four stars for the restaurant, a title held only by five restaurants today. That year, Pinkerton was promoted from Pastry Sous Chef to Executive Pastry Chef, and she deservedly reached the national spotlight in 2011 by taking the highest honor in the country for a pastry chef: the James Beard award for Outstanding Pastry Chef. Here’s a fun piece about that honor from her hometown’s newspaper in Ohio. Pinkerton held the Executive Pastry Chef title at Eleven Madison Park for five years, overseeing a period when the restaurant had no shortage of cleverness and lofty ambition, serving carrot tartare in place of beef, for example, and creating a “New York History” tasting menu that included a mystery card game to determine one of the desserts for each diner. In 2014, she left the restaurant and New York for the greener (golden, really) pastures of San Francisco. This is where we need to step in and clarify for the general dining public that Pinkerton didn’t move to San Francisco because of Che Fico and Theorita, contrary to what many articles suggest. Pinkerton overlapped with David Nayfeld in Eleven Madison Park’s kitchen for a few years and the two became friends. 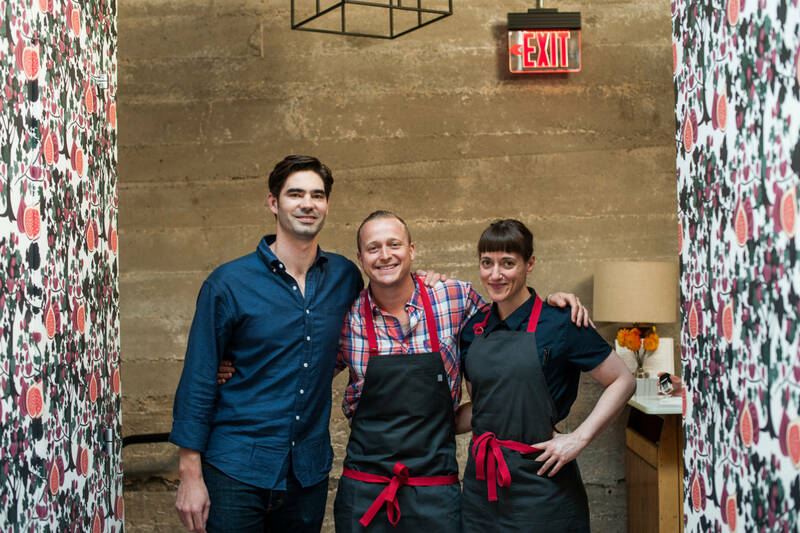 Nayfeld is a Bay Area native and had subsequently moved to San Francisco after Eleven Madison Park, so the two connected and Nayfeld helped Pinkerton adjust to the Bay Area. She would even go to his family’s home for Thanksgiving. Pinkerton spent several months working with Craftsman and Wolves’ William Werner to develop new pastries, coinciding with that bakery’s expansion to Russian Hill (now closed) and the Bayview, and a potential addition in Los Angeles that never happened. However, she really missed the energy of being in a restaurant. Nayfeld always had plans for a Divisadero restaurant (what became Che Fico) with business partner Matt Brewer, a driving force behind some of Chicago’s marquee restaurants as a co-founder of the restaurant group Hogsalt Hospitality. Pinkerton signed on to help with their restaurant’s dessert program. Then, things really fell into place a little bit by chance when the third project of the Divisadero former auto shop complex (Che Fico, Boba Guys and Concept C) fell through. Che Fico’s investors were huge fans of Pinkerton’s work, both from her resume and desserts she made at dinners for them in San Francisco. So, this third space could be her domain. Pinkerton admits that it was “kind of crazy” that Che Fico and Theorita opened so close together, but the team was ready. Nayfeld is very much the lead voice at Che Fico with Pinkerton in charge of desserts, while it’s loosely vice versa for Theorita with Pinkerton’s baking and desserts as center stage, and Nayfeld responsible for the main breakfast, lunch and dinner food menu that compliments Pinkerton's extensive program. The experience at both restaurants is truly elevated to a pretty special level because of the unique ideas and skills each brings to the two kitchens. 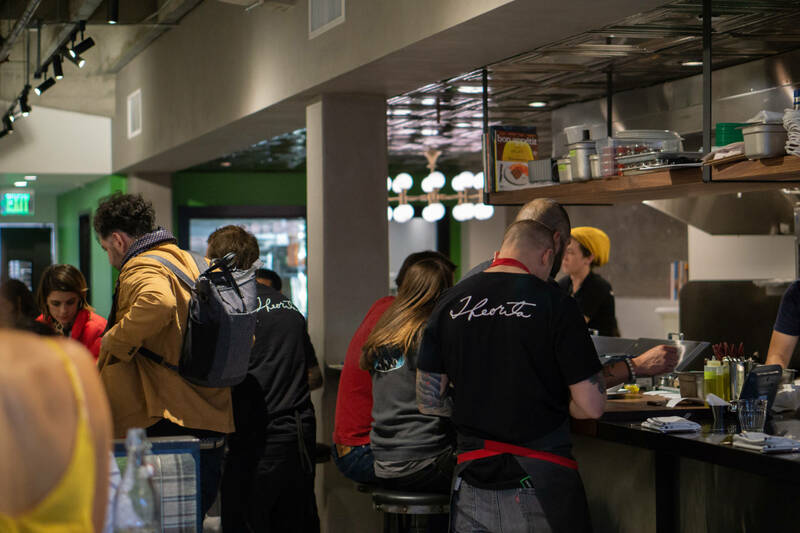 Nayfeld’s creations at Theorita vastly differ from Che Fico, but do have a similar contemporary/Californian take on a classic cuisine, just with Italy replaced by Iowa or Indiana. The dinner menu takes over at 5 PM, complemented by an impressive list of natural wines and Northern California beers. 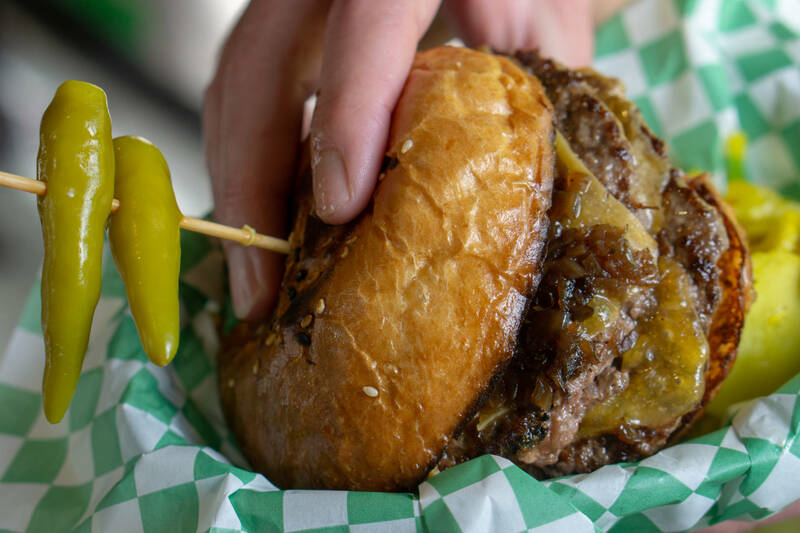 The double-stack burger with “special sauce” and both raw and caramelized onions on a potato bun is a blissfully messy affair, with the Marin Sun Farms “Mindful Meat” ground beef given a distinctive griddled exterior char ($15). It’s one of the most popular items for lunch and dinner with the fried chicken sandwich ($13) spruced up with shredded cabbage and housemade Sriracha. Pinkerton’s pastry case welcome guests at the door, where menus for counter service often mean there is a lot of lingering (it’s table service at night and planned to begin for weekend brunch soon) in front of the tempting baked goods. Then there are the diner design staples once you get past the entrance area — an open kitchen with stations in a line from griddle to fryer to salad assembly; a dozen stools at the granite kitchen counter; tufted booths in flannel, denim and leather that are inspired by the wardrobe that Pinkerton’s grandfather wears in a photo at the entrance with his wife, Theorita, and a motorcycle; and a glazed black and white tile floor. Some modern elements from designer Jon de la Cruz (Che Fico, Leo's Oyster Bar) step into the equation, too, like exposed concrete walls and rafters above; colorful, groovy paintings of various people by local artist Tracy Piper above the booths; and a window in the rear of the space that allows diners to see into the pastry kitchen. Calling Theorita just a “pie shop and dinette” is selling it short, much like labeling Che Fico as a place for just pizza and pasta. It’s a vintage Americana experience that reaches back in time, while leaping forwards, and making the genre fresh again. 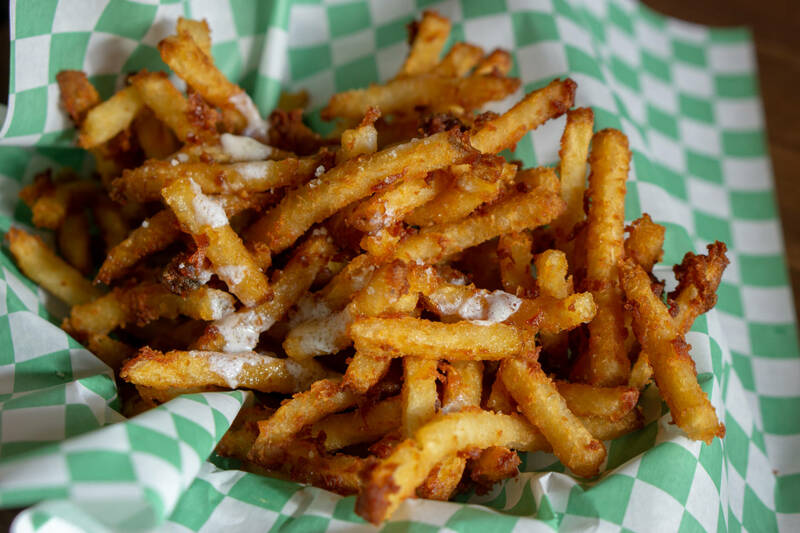 A ricotta and berry Danish or a pile of butter fries might not convince us that happy days are here again. However, for at least a few moments, these days are ours when sitting in a Theorita booth and digging into a slice of pie. Hours: Breakfast Wednesday-Friday 7AM-11AM and Saturday-Sunday 8AM-3PM. Lunch Wednesday-Sunday 11AM-3PM. Dinner Wednesday-Sunday 5PM-11PM. Pastry case is open all day.